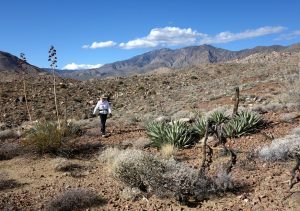 Anza-Borrego Desert State Park is the largest state park in California, with over 600,000 acres. The Park features washes, wildflowers, palm groves, cacti and sweeping vistas. Extending over 900 square miles, elevations range from 6,000-foot peaks to land only 15 feet above sea level. Five hundred miles of dirt roads and extensive hiking trails provide visitors with an unparalleled opportunity to experience the wonders of the California desert. The Park is named after Spanish explorer Juan Bautista de Anza and the borrego, the Spanish name for bighorn sheep. While exploring you will likely see a variety of wildlife. The Peninsular Bighorn Sheep is the namesake of the Park, but can be very elusive. 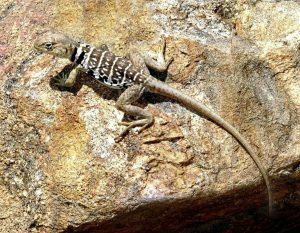 Roadrunners, desert cottontails, black-tailed jackrabbits, Gambel's Quail, and a variety of reptiles could be more frequently spotted. Nighttime sounds include those made by coyote, long-eared owl, bobcat, kit fox, and numerous bats and rodents. Plants of the Anza-Borrego desert are both unique and beautiful. Inquire at the Visitor Center for recommendations on hiking, road conditions, and wildlife sightings. A free park magazine presents information about the different resources in the Park, along with a basic map. A more detailed park map can be purchased at the Visitor Center's store. Download the ABDSP Park Magazine before you visit. The Park is located on the eastern side of San Diego County, with portions extending east into Imperial County and north into Riverside County. It is about a two-hour drive from San Diego, Riverside and Palm Springs. We suggest that you map the best driving route before you visit. Be sure to enter "Anza-Borrego Desert State Park Visitor Center" into your Google Maps search in order to get the correct location. ABDSP's Visitor Center offers many free interpretive activities for the public. Find all activities on our Event Calendar or look for a link to this month's Interpretive Schedule at Anza-Borrego Desert State Park's website. Questions? Call the Visitor Center at 760-767-4205.